It wasn’t until the Middle Ages that the myth and superstition surrounding Mars began slowly to be replaced by observation and scientific fact. Its orbit was first calculated by Copernicus in the early 1500s, who assumed the path traced around the Sun to be a perfect circle. Soon after, Brahe and Kepler came on the scene to provide us with the picture we know today. With the invention of the telescope a century or so later Mars was recognised as the planet it is, and investigations into this alien, yet Earth-like, world could begin in earnest. As the prologue to The Scientific Exploration of Mars states, this book is about the process of exploring the planet Mars. Its aim is to explain “the key short- and long-term [scientific] objectives, and how progress is made in practical terms”. It does an excellent job of condensing down the sum of our scientific knowledge into a hundred-odd pages in the middle of the book, but that isn’t the main focus of the narrative. 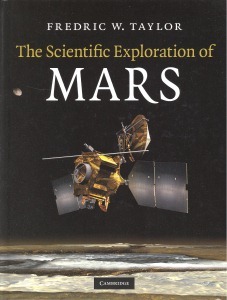 Instead, it is broken down into three sections: the first discusses the history of Mars exploration, from those early efforts by Copernicus, Brahe and Kepler, via Lowell and his canals, to the more modern telescopic and robotic missions; the second describes the current state of our scientific knowledge about the planet, as well as the remaining big questions; while the final part looks onward to the future of martian exploration. Taylor, currently Halley Professor of Physics at Oxford University, proves to be an engaging and amusing guide, discussing the scientific outcomes of missions such as the Mars Exploration Rovers with as equally a light touch as he describes the political wrangling which brought the mission into being. The journey of the Mars Climate Sounder (MCS) instrument, partly built at Taylor’s laboratory at Oxford, is a nice example: built and flown for two separate missions, each time destroyed as the spacecraft was lost. The MCS finally made it to Mars on-board the Mars Reconnaissance Orbiter in 2005, almost twenty-five years after the instrument was first conceived. In the epilogue, Taylor imagines what the exploration of Mars will be like two hundred years hence, first cautioning that any such predictions “will not be accurate – that is impossible – but still the game must be played, if only to amuse future readers”. The recent cancellation of NASA’s Constellation programme rather makes his point, but it is a thought-provoking way to end the story. The Scientific Exploration of Mars is something between a reference book and popular science writing; detailed enough to tell you all the necessary facts, yet entertaining and insightful enough to make you want to read from cover to cover. For those interested in finding out how we came to know what we do about Mars, this is a fine place to start.